HDD unit shipments dipped below 115 million in the fourth calendar quarter of 2015 due to weak PC sales and impact of SSD incursion in notebook computers. For the year, HDD sales were down 16.9% to 469 million units according to TRENDFOCUS’ CQ4 HDD Market Update. However, exabytes shipped in HDDs continues to expand to satisfy booming requirements from data centers. The largest market segment for HDDs – personal computers – fell by 25% to just over 300 million units. Much of the decline is owing to the contraction of the PC market, which receded by nearly 10%. In notebook and portable PCs, solid-state drives (SSDs) gained a larger position and displaced millions of HDDs. While HDDs will continue to control the bulk of the PC market for some years, the long-term trend is for expanded utilization of SSDs as prices decline. Enterprise HDDs, specifically those used in servers and data centers, grew marginally in 2015. Traditional enterprise drives, high performance products that rotate at 10,000rpm and 15,000rpm, were down slightly for the year. SSDs finally began eroding the decades-long dominance of the high-performance HDD market, although HDDs in this segment will continue to play an important role for many years. Storage capacity shipped to applications like cloud storage and data centers expanded 33% in 2015, as demand soared for capacity-intensive HDDs, also known as “nearline” drives. Per-drive capacities reached 8 terabytes, with both 10 and 12 terabyte models shipping later this year. Innovation will propel capacities to more than 20 terabytes within a few years. The extremely low cost of HDD storage will keep HDDs as the storage medium of choice for hyperscale data centers. 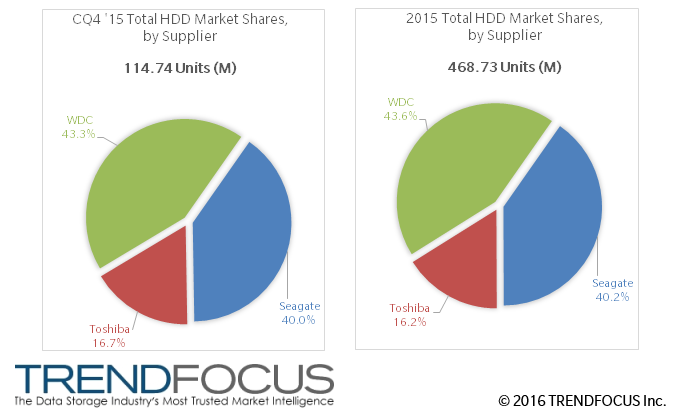 Western Digital achieved a total HDD industry market share of 44%, although Seagate Technology was close behind at 40%. Toshiba maintained a 16% share for the year. This entry was posted in TRENDFOCUS Blog and tagged Enterprise, HDD, PC, Seagate, Toshiba, WDC. Bookmark the permalink.